GAZ Motorsport/Track Use Coilovers GGA433. Vauxhall Astra Mk4 1998 - 2004. Telescopic Rears Not Coilovers, Rear Height Adjustment Achieved By Lowered Springs And GAZ Adjustable Spring Pans Supplied. Gaz Gold height adjustable kits are a premium range of suspension units designed for tarmac motorsport and the serious track day enthusiast. Front and rear units adjust bump and rebound from a single control knob on the side of the unit. Struts and semi struts have 62mm bodies for increased oil capacity. These units are fitted with 22mm diameter induction hardened piston rods that are hard chrome plated for strength and durability. All units have multi lip sealing. The outer seal is a metal encased wiper to clean the piston rod. This in turn extends main seal performance and oil retention under extreme conditions. All the Gold range are fitted with a gas cell in the outer reservoir and filled with a high viscosity index multi grade oil to prevent cavitation and reduce fade in motor racing conditions. The coilovers and telescopic units in this range utilise lightweight billet alloy components where possible, i. Bases, end fittings, seats, lockrings, rod guides and gland nuts. The outer tube is steel with a nickel coating to provide the best anti corrosive finish possible. All outer alloy components are anodised. These kits can obtain much lower ride heights for show purposes only but the vehicle should not be driven at these levels as the steering and drive shaft joints can lock out. These kits are special order units and may take up to 6 weeks to be delivered to your door. Cheques (allow up to 10 days for cheques to clear before goods are sent). We are dedicated to ensuring the highest possible quality service to our customers, always going above and beyond! See the tabs below for more information about us and our policies. We are a family run business started back in 2004 offering car customising and performance products from top brands such as Forge, K&N, Bailey, Wossner, Walbro, Gaz, The Loudest and many more. We also have products manufactured for ourselves and these are made to the highest standards. Over the past 9 years here at Motorbling we have also expanded our product range into standard replacement parts such as Brakes Pads from EBC and Wing Mirrors from Lucas, so we can now offer everything you need, from customising, to performance to standard replacement parts for MOT'S and general repairs. You must take reasonable care of the goods and immediately return them at your own expense. Please ask for a "Proof of posting certificate" as we cannot be held responsible for goods that go missing whilst in transit. Ve sent you the wrong item or size, please double check the full description in the listing, including the UK size before requesting a return. 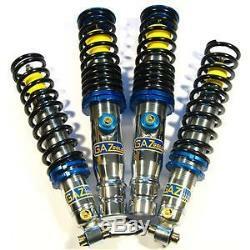 The item "GAZ GOLD COILOVERS VAUXHALL ASTRA Mk4 98-04 SUSPENSION GGA433" is in sale since Friday, January 21, 2011. This item is in the category "Vehicle Parts & Accessories\Car Tuning & Styling\Performance Suspension\Other Performance Suspension". The seller is "motorbling" and is located in GB. This item can be shipped worldwide.